At The Turn Of The 17th Century The Most Popular Drink In Britain Was? Astronomers At The Parkes Telescope Identified What As The Cause Of Mysterious Interference? When prompted to guess the favorite drink of Britons you would hardly be foolish to guess tea. The love the British have for tea is long running, incorporated into their daily lives, and understood even by people who have never been to the British Isles thanks to references in everything from movies to cartoons. What’s curious is that tea wasn’t always the favored drink of the British people and even a few short centuries ago wasn’t consumed with anywhere near the frequency it is today. Their drink of choice? Coffee. The first coffee shop opened in Oxford in 1650 and many soon followed to keep pace with the demand for coffee. The caffeinated beverage proved so popular that by the early 1700s there were as many as 3,000 individual coffee shops in the city of London alone. The coffee craze was relatively short lived, however, and shortly after the turn of the century tea was on the upswing thanks to two factors. 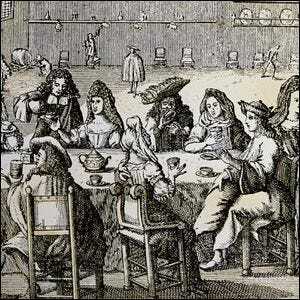 First, Queen Catherine, the wife of King Charles the II, brought tea into vogue by drinking it frequently and serving it in her court (1660s). Second, the rise of the influential East India Company completely flooded the English market with tea (1720 – 1750). Between the two, the deal was sealed and tea has remained a staple of British life ever since.